The ECR4Kids Sleepy-Time Everyday Rest Mat is a comfortable and durable rest time solution for preschool age children with superior features and functionality. This 3-section mat offers a cozy 1-inch dense foam core covered in a radio-frequency heat-sealed vinyl to keep liquid out and prevent bacteria growth. The heavy-weight 10 mil vinyl covering helps to resist tears and makes mats easy to clean. Maintain sanitary conditions with the dual-colored grey/blue mats by placing the blue side on the floor and the grey side for sleeping. The ECR4Kids Sleepy-Time Everyday Rest Mat is a comfortable and durable rest time solution for preschool age children with superior features and functionality. 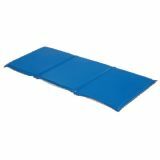 This 3-section mat offers a cozy 2-inch dense foam core covered in a radio-frequency heat-sealed vinyl to resist liquid and prevent bacteria growth. The heavy-weight 10 mil vinyl covering helps to resist tears and makes mats easy to clean. Maintain sanitary conditions with the dual-colored grey/blue mats by placing the blue side on the floor and the grey side for sleeping. The Sleepy-Time Value Rest Mat is a low-cost rest time solution for preschool age children with superior features and functionality. This 4-section mat has a 1-inch dense foam core covered in a radio-frequency heat-sealed vinyl to keep liquid out and prevent bacteria growth. The 8 mil water-resistant vinyl covering is 30% thicker than the competition which helps to resist tears and makes mats easy to clean. Maintain sanitary conditions with the dual-colored grey/blue mats by placing the blue side on the floor and the grey side for sleeping. The ECR4Kids Sleepy-Time Value Rest Mat is a low-cost rest time solution for preschool age children with superior features and functionality. This 4-section mat has a 5/8-inch dense foam core covered in a radio-frequency heat-sealed vinyl to keep liquid out and prevent bacteria growth. The 8 mil water-resistant vinyl is 60% thicker than the competition which helps to resist tears and makes mats easy to clean. Maintain sanitary conditions with the dual-colored grey/blue mats by placing the blue side on the floor and the grey side for sleeping.